Hunters looking to extend their ethical hunting range have opportunities to attend Outdoor Solutions’ Long-Range Shooting Schools. Four openings are available for the Utah range on June 6-9. The final 2019 Texas long-range school session now offers the option to include a hog hunt after class instruction ends. The dates for the hog hunt combo in Texas is October 23-27 and will fill up soon. As part of their outfitter vetting services pairing hunters with the top trusted outfitters across the globe, Outdoor Solutions also specializes in preparing hunters who expect to take longer shots in the field. With many hunters yet to down an animal at longer distances, Outdoor Solutions’ Long-Range Shooting School will help extend their hunting distances and instill the confidence needed when it matters most. The two-day classes focus on reconfirming shooting basics, teaching proper shooting techniques and highlighting the limitations of both the hunter and equipment. The classes include bench shooting, in-field practical shooting, how to correctly use optics, creating a range card and using a ballistic app for their equipment combination. Outdoor Solutions’ instructors are highly qualified with years of experience in teaching with backgrounds in military and law enforcement. Instructors present the information in easy-to-understand presentations that are not overwhelming or confusing. Class sizes are also kept low for a high instructor-to-student ratio with plenty of one-on-one time. The classes include transportation to and from the lodge, food and beverages, three-nights lodging and two days of training. Days are filled with learning and practicing new learned skills while evenings are casual and spent relaxing and discussing the day’s events. 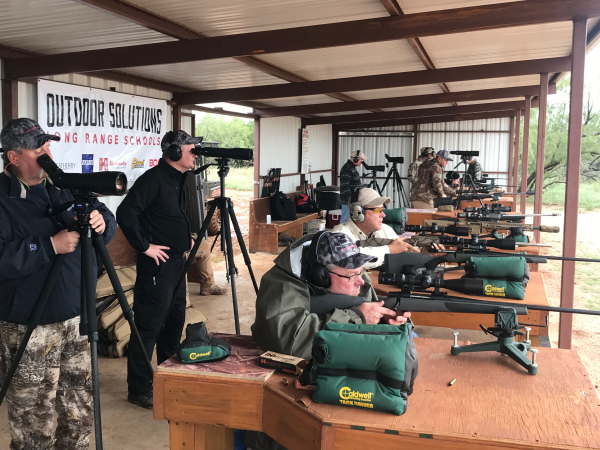 Based in Tulsa, Oklahoma, Outdoor Solutions provides expert instruction at long-range shooting schools in Texas and Utah and has trained hundreds of shooters and hunters to extend their effective shooting ranges. Outdoor Solutions also provides outdoor enthusiasts access to hundreds of pre-vetted hunting and fishing destinations around the world. The Outdoor Solutions staff has successfully planned thousands of hunting excursions, fishing trips and corporate retreats.